For submitting new manuscripts or tracking the existing ones, login or register to the Submission Tracking System. Our journal is open for new team member applications in various positions, such as: editor, editorial board member, copyeditor, language editor. More info is here. Open for Special Issue Proposals: The journal of RESM is open to proposals for special issues on emerging related topics. More info is here. The plane state of stress in an elastic-plastic rotating solid disk of exponentially varying density is studied. Elastic-plastic stresses and displacement have been derived using Tresca’s yield condition, its associated flow rule and linear strain hardening. Results obtained have been discussed numerically and depicted graphically for different geometric parameters. The results for uniform density are verified with those available in literature. It is observed that with the variation in density exponentially (decreases radially), high angular speed is required for a material to become fully plastic which in turns give more significant and economic design by an appropriate choice of density parameters. © 2016 MIM Research Group. All rights reserved. 07/01/2019 Collaboration for IMSMATEC 2019: Editorial Board of our journal and Organizing Committee of The International Conference on Materials Science, Mechanical and Automotive Engineerings and Technology (IMSMATEC 2019) have agreed to collaborate. Extended versions of the selected papers from the conference will be published in our journal. For more see Events. 25/12/2018 Collaboration for iSTE-CE'2019: Editorial Board of our journal and Organizing Committee of International Conference on Innovation, Sustainability, Technology and Education in Civil Engineering (iSTE-CE'2019) have agreed to collaborate. Extended versions of the selected papers from the conference will be published in our journal. For more see Events. 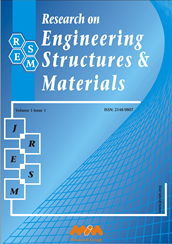 23/12/2018 2018 Most Cited Paper Award: The paper authored by Jouni Freud and Alp Karakoç entitled as “Shear and torsion correction factors of Timoshenko beam model for generic cross sections" is awarded the 2018 Most Cited Paper Award of Research on Engineering Structures and Materials (RESM). We congratulate the authors and wish them a continued success. 23/12/2018 2018 Best Paper Award: The paper authored by Nelson C. Batista, Rui Melicio and Victor M. F. Mendes entitled as “Darrieus vertical axis wind turbines: methodology to study the self start capabilities considering symmetric and asymmetric air foils” is awarded the 2018 Best Paper Award of Research on Engineering Structures and Materials (RESM). We congratulate the authors and wish them a continued success.